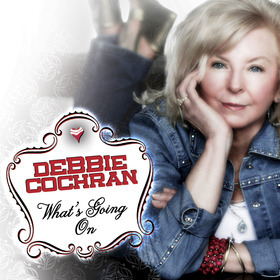 Traditional country songstress Debbie Cochran is winning over radio stations across the country with her latest single "What's Going On." Produced by Grammy nominated Kent Wells (Dolly Parton), Debbie is staying true to her traditional roots as she mixes relatable lyrics and passionate vocals with a classic yet refreshing sound. Her southern soulful charm strikes a chord with listeners, as well as critics, as the single has been receiving rave reviews. Debbie traverses a path to fulfill her lifelong dream of being a recording artist and is proving that it's never too late to pursue your childhood aspirations. This wholesome, inspiring 'halo-country' tune is off her latest album, Before We Met The World. This "Helen Mirren meets Debbie Boone" performer is winning the hearts of radio stations and fans nationwide. She recently performed in Iowa at the annual Winnebago Grand National Rally, which draws in over 1600 motor homes. Her previous release, It's Never Too Late, received Music Row Magazine's DisCovery Award from country tastemaker Robert K. Oermann. Her story and music spreads smiles and serves as a testament to the vitality of the human spirit. She lives her lyrics everyday by stepping in the studio, writing new songs and gracing the spotlight. For more information on Debbie Cochran, please visit www.DebbieCochran.com or www.Facebook.com/DebbieCochranMusic.